We conceptualize. We design. We create. We responds on a timely manner. We able to work from given ideas. We love and enjoy our work. Our COMPLETE WEB SOLUTION includes all the fundamentals for an efficient website and gives you an edge over your competition. Choose the website design and development package that best appropriate to your needs. This package is perfect for web starters who wants to have web presence. This package is perfect for individuals or business who wants to have web presence and promote something such as photo galleries, blog and etc. This package is perfect for individuals or business who wants to sell their products via online. 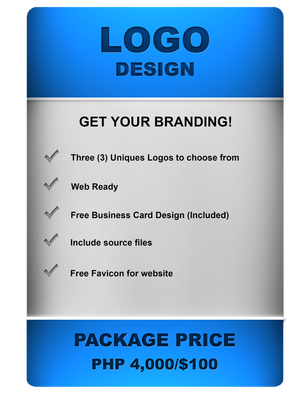 Logo is the most important part of the business. It will help your business to be more competitive. Our designer will help your business to get a design that will fit your company's image and market. Branding is the secret of your Online Success. ﻿﻿Note: Service fee for Printable Customized Banner Design is Php 600.00 ($ 14)-Php 2000 ($ 45) depending on the concept and size.